I’m not into the Superbowl, but I like the snacks and the commercials. This would be a fun and easy game time food. I was feeling especially southern when I planned this meal. 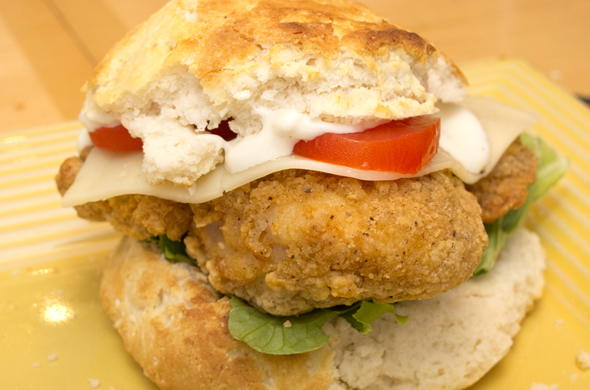 I made a top-your-own crispy chicken sandwiches on biscuits. I went all-American on mine with ranch, lettuce, tomato, and cheese. They were good, but tough to keep together to eat. I’d recommend making smaller biscuits than I did! Bake chicken until heated through or until cooked through. Prep toppings and let eaters top-their-own. Build-your-own or top-your-own makes for a low-prep meal or for very easy entertaining. Pardon the posting irregularity. Family comes first. The C side of my family is enduring the challenges of a lifetime right now. It is unbelievably difficult, painful, and more than anyone deserves to have to deal with. Mr. J says it best when he says “we’re a strong family, we can handle anything.” I’m trying to be strong, helpful, and encouraging but I also find myself seeking support. There’s a long road ahead. Food won’t get us through, but good food can’t hurt, right? I saw an article about some grocery store items for dinner time-prep saving tips. Most of the tips were pretty lame. Umm using jarred salsa? Hello! I realize you can make your own but that’s not really a “tip” in my book. Buying canned soup…that doesn’t even transform the ingredient! I did think using frozen creamed spinach could have some possibilities. I thought about it as a pizza topping/sauce rather than for pasta. Remove sausage casing and pan fry with garlic until cooked and crumbled. Drain off any grease. Preheat oven to 375 degrees and spray a 9’ round cake pan with non-stick spray. Defrost/warm creamed spinach according to package directions. 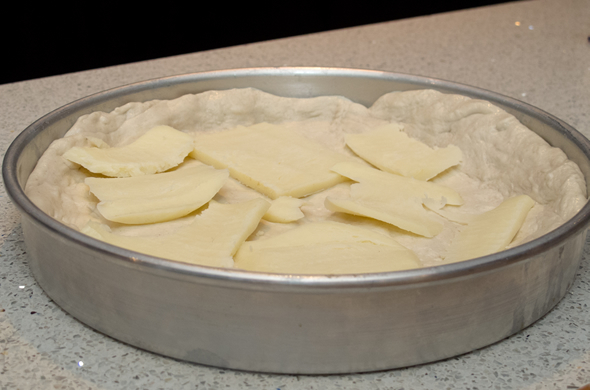 Spread the pizza dough into the pan, and up the sides. 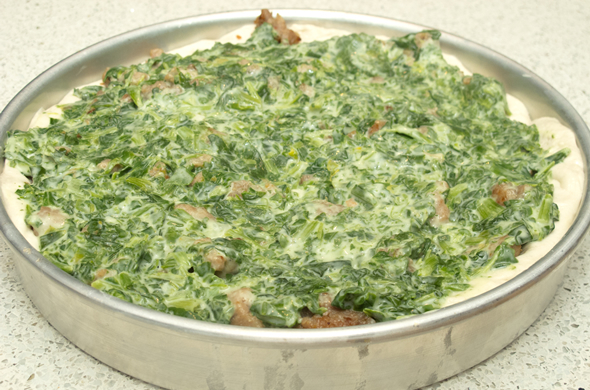 Layer mozzarella slices on the bottom, then sausage, then, creamed spinach. 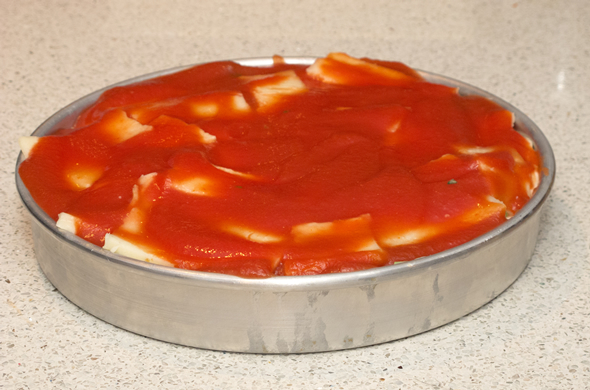 Lay a few more slices of mozzarella then spread marinara over the top. 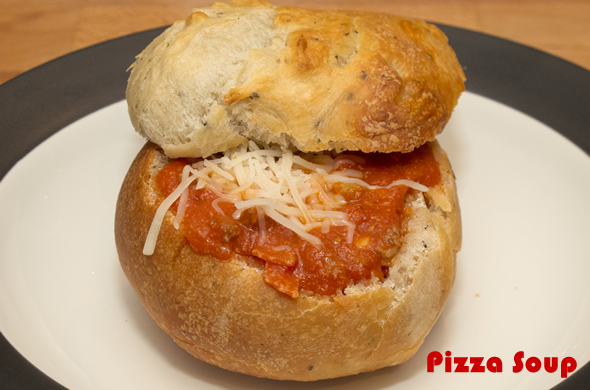 Put pizza onto a baking pan (for any overflow) and bake for 30-40 minutes. 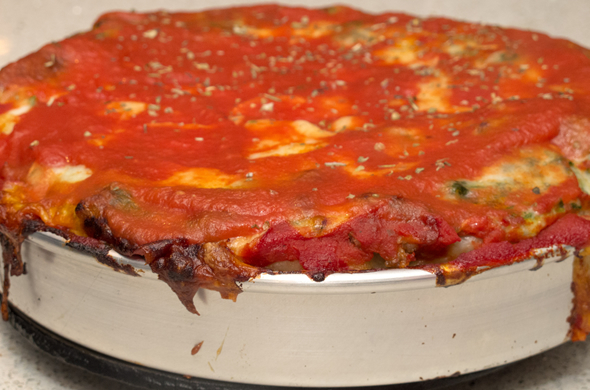 This was the best deep dish pizza I ever made. 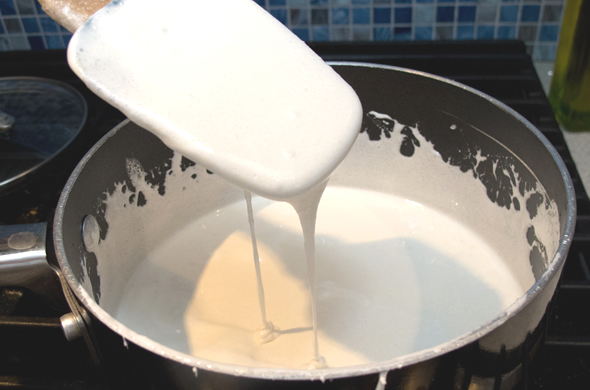 When cutting into a piece, a fork could stretch the thick mozzarella slices an arms length. The creamed spinach was such a good trick. It is creamy and decadent while adding some great color. This would be good on a regular pizza too, or as a quickie base for spinach and artichoke dip. I just might have to keep some in my freezer for inspired dinner moments just like this! 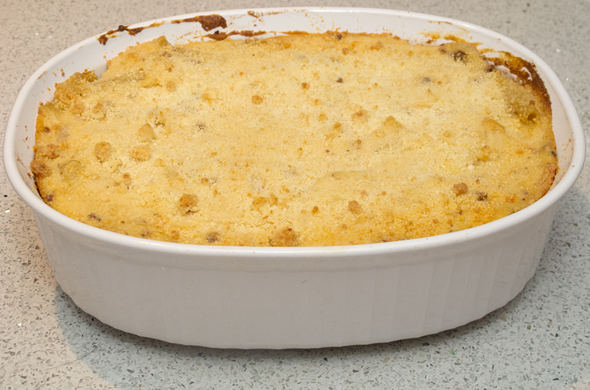 I love greek food and swooned when I saw Ina Garten make pastitsio. She served it with a feta and watermelon salad at her lovely house in the Hamptons. Greek dinner in a garden setting? I’d love that! It seemed so magical and inviting. A lantern lit pathway and fresh flowers never hurts, right? I thought it might be a good wintery food. I made this a few weeks ago but it would be perfect right about now. The C family is enjoying comfort food and family during this difficult time. This seemed like a good post for a Friday because, this is a weekend meal if I ever saw one. 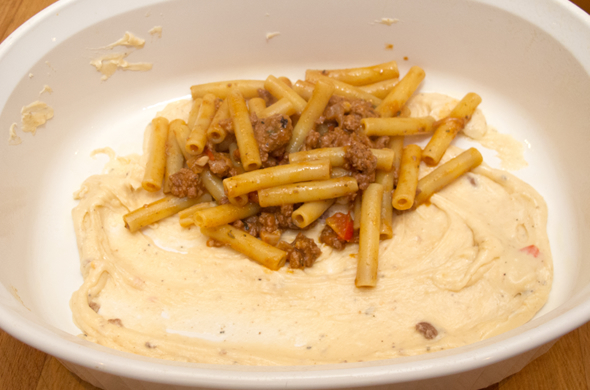 Don’t go trying to whip up Pastitsio on a week night. 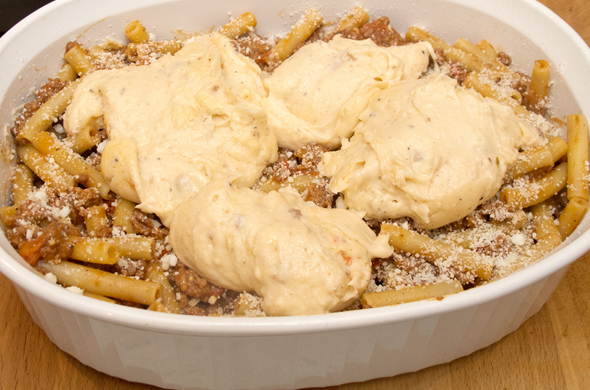 Some folks joke that pastitsio translates to messy kitchen. 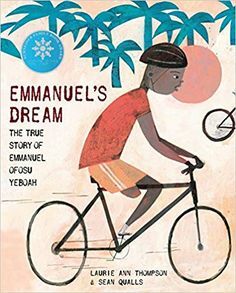 Read the whole thing so you can be ready for the next step. 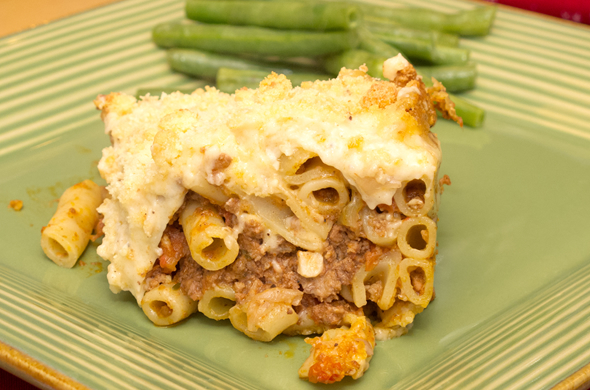 Pastitsio requires meat sauce, the pasta, and the cream sauce. 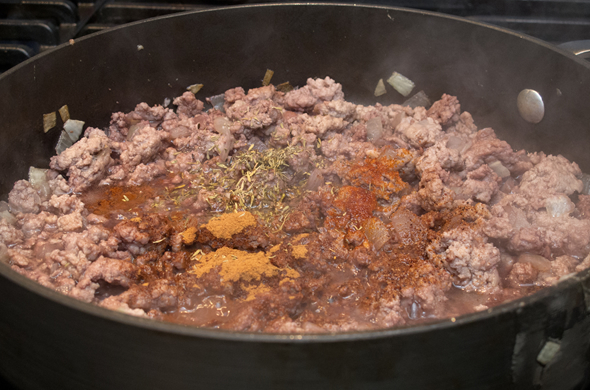 You could break up the work by prepping the meat sauce the day before. I love the cinnamon flavor for savory Greek dishes. I think the cream sauce on the top compliments the tomato and the red wine flavor. 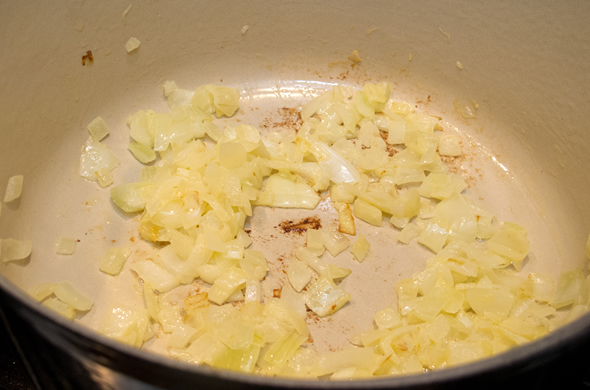 In a large pan, saute onions in olive oil over medium heat, adding garlic just when the onions become translucent. Add in ground pork, breaking it up with a spatula. Then add red wine, cinnamon, nutmeg, oregano. Cook for about 10 minutes, stirring occasionally. 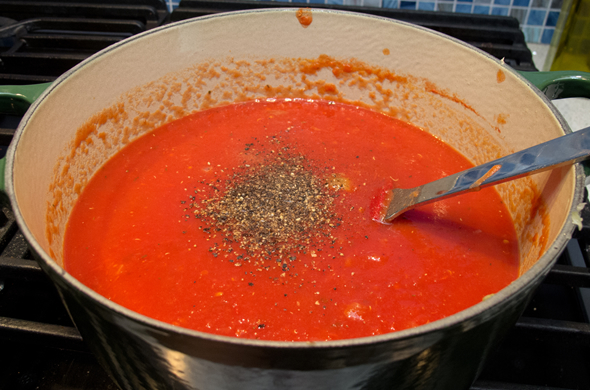 Add tomatoes, salt, pepper and simmer for 20 minutes so the liquids evaporate and the sauce/mixture gets thick. Put the pasta in the boiling water and cook according to the box (undercook by 2-3 minutes as it will bake and continue cooking). In a medium saucepan, melt butter over low heat. 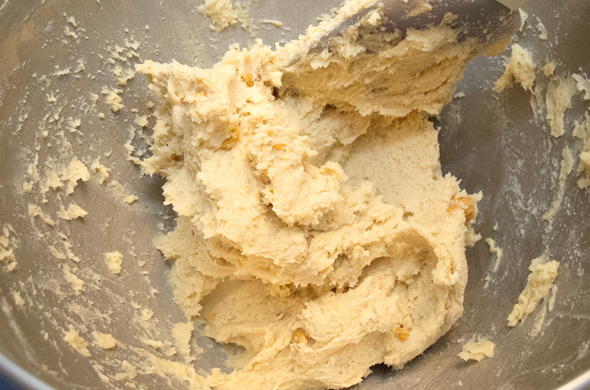 When butter is melted, add in flour and cook for 5 minutes, stirring. 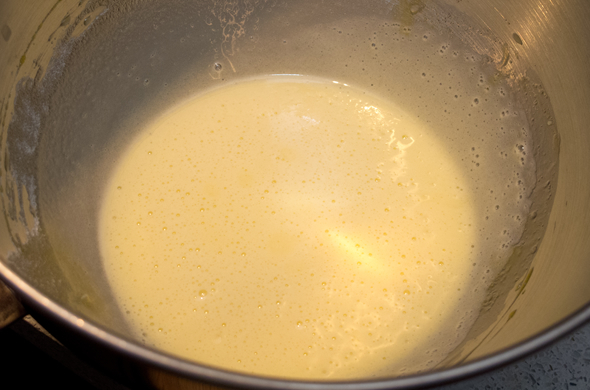 Add in the milk, whisking until smooth. Add salt and nutmeg and ½ cup of cheese. 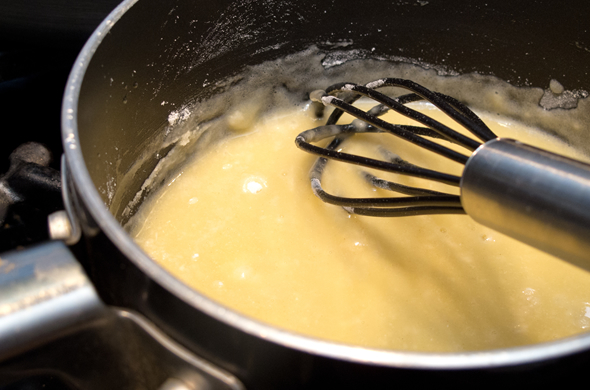 Once it begins to cool slightly, add in 1 egg and whisk quickly so the egg doesn’t cook. 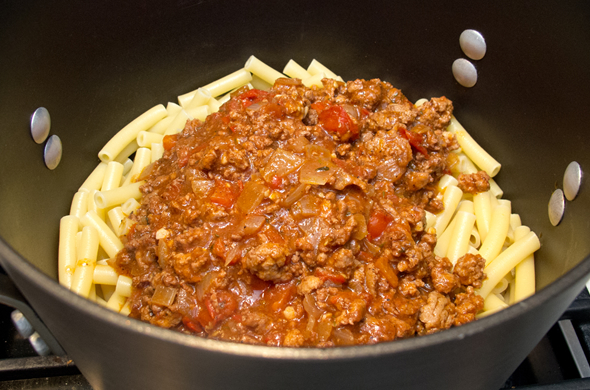 Mix pasta and meat sauce. 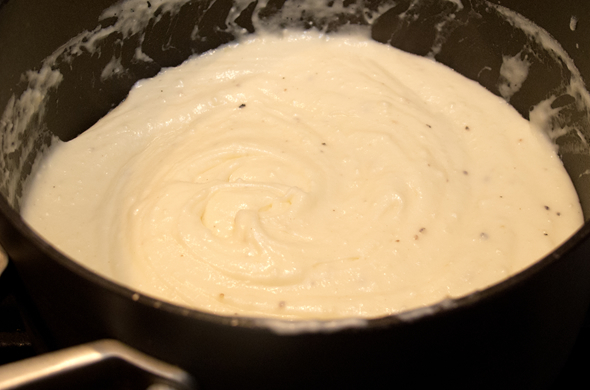 Spread ¼ cup of the bechemel sauce onto the bottom of a non-stick-sprayed 13”x9” baking pan. Layer the pasta and meat mixture into the pan. Spread bechemel sauce over the top of the pasta/meat mixture. Bake for 30 minutes covered. Sprinkle the top with remaining cheese and bake for an additional 20 minutes uncovered. Remove from the oven and let sit for 10 minutes before cutting. This takes awhile to get assembled but then it just cooks without you…leaving you plenty of time for all the many dishes accumulated throughout the process. I loved this. I like the Greek use of cinnamon in savory dishes. This is rich and filling. We ate it for a few dinners & lunches. It reheated nicely. 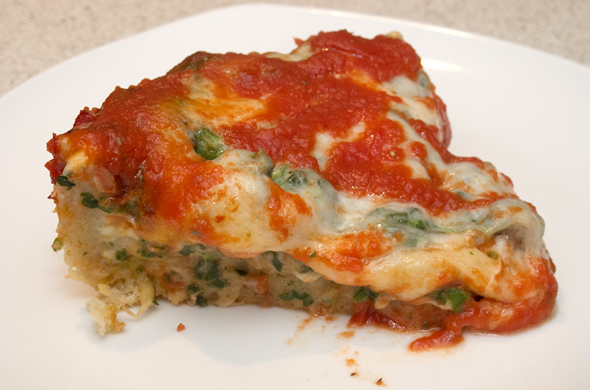 Today’s round up is a few lasagna tips in honor of my father in law. Lasagna was his favorite way to test an Italian restaurant and I’ll always remember him telling me that! 5) Make 2, double the recipe or split it into 2 pans. It freezes well for another time or makes a great gift (include reheating, freezing instructions, and ingredient info if you’re gifting it). 4) Continue the ‘power of 2′. Be sure to use more than one sauce and more than one meat. I like marinara and alfredo, or pesto adds a welcomed freshness. If you want to stay more traditional think about bruschetta topping as a sauce. I usually do ground chicken and sausage, but ground pork and ground beef would be good. Or something ground and pancetta/prosciutto. 3) Lots ‘o veggies. Add in chopped spinach, or leeks, or shredded zucchini. The veggies add lovely color and who doesn’t need a hidden serving of veggies? I like diced veggies rather than slices but that’s your call. 2) Forget the low-fat ricotta. It isn’t the same. Food processing cottage cheese is a healthier option. Or add in some plain greek yogurt for some creaminess and protein. 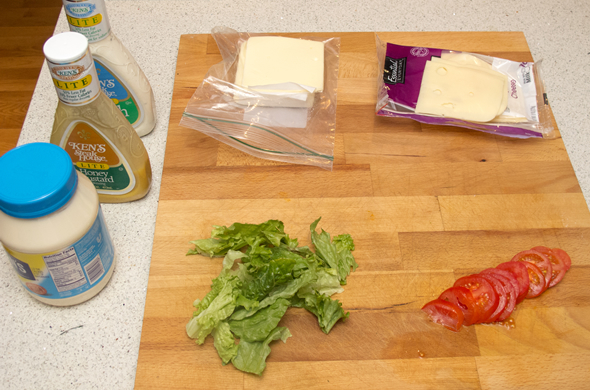 Sliced mozzarella or provolone are easy additions too for cheese. 1) Think of alternative ingredients. 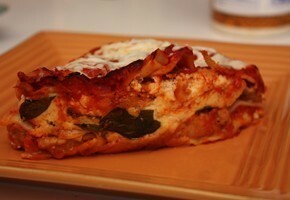 I love butternut squash lasagna or veggie lasanga. It can be a good use for leftovers like meatloaf or a surplus of veggies. You can “cheat” and use ravioli in place of the pasta & ricotta layers. Dig around in your fridge. Any veggies can go in, or chopped sliced deli meat. Tapanades or spreads could give it a Mediterranean flavor. Make it your signature dish! What I Ate is a series of posts that don’t exactly warrant a recipe, but hopefully are inspiring if you’re stumped for dinner ideas, or if you’re new to cooking…these guys are easy. Has this week felt like a doozy to anyone else? Easy dinners keep us all sane. Nobody is at his or her best when hungry. 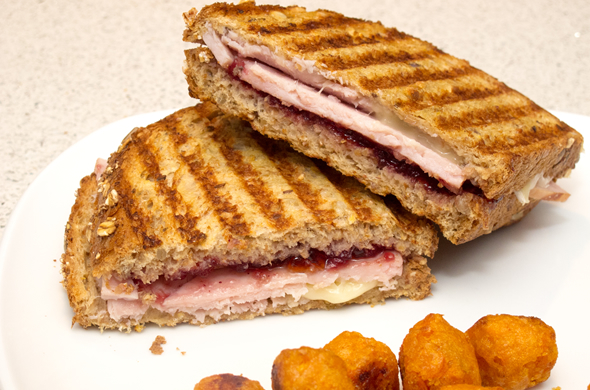 Paninis are the best. I like that they totally simplify dinner, only use a few ingredients, are pretty cheap to make, and provide leftover staples. What more could you want out of dinner? I served a salad bar and paninis to a group and it was a hit. I think both are customizable and crowd-pleasing. For this particular one, I wanted something that felt seasonal or winter appropriate. Paninis are great in the summer to avoid heating up the oven, but anywho…I digress. Heat a grill pan, panini press, or frying pan over medium heat sprayed with non-stick spray. 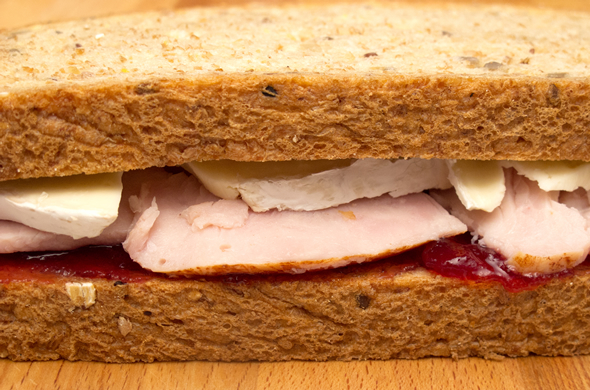 Assemble sandwiches with cranberry spread on one side, turkey slices, and brie slices. 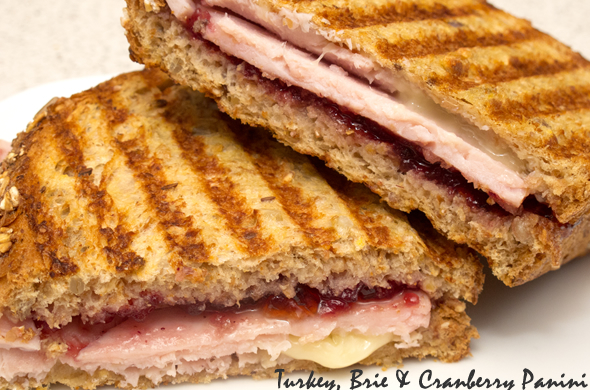 Grill sandwiches a few minutes on each side until crisp and until cheese is melted. I love brie with berries. I added some jam to the cranberry sauce so it wasn’t quite as tart. I splurged for carving board sliced turkey so it was more like real off the bird turkey breast. It was worth it. It wasn’t a very veggie-centric menu but it was fast, cheap, and flavorful. I love my press. I use it regularly and love that it has removable plates (grill, griddle, and waffle inserts) that are dishwasher safe. It is super handy for quesadillas and opens flat to be a larger 1-sided surface. It is really helpful to multi-task or do a few at a time but a frying pan will work well too. It even lets me unhinge the top so it closes evenly and doesn’t squish the back of the panini more than the front. Genius. I served these bad boys with some sweet potato tots for a super easy dinner to keep the nightly options varied! total: $9.02 for 2 people, or $4.51 per person. Your fav lunch spot charges LOTS more than that. Planning your weekly menu? Sliced chicken or ham would be good too. Don’t go buying ingredients you won’t use again! I love whole berry cranberry sauce. In fact, it’ll prob sweeten up my smoothie or be the star of my oatmeal since it isn’t just for dinner to me! I got some ice cream makers for Christmas. By some, I mean 2…how well does everyone know me?! (wait till I debut what the duplicate became!) 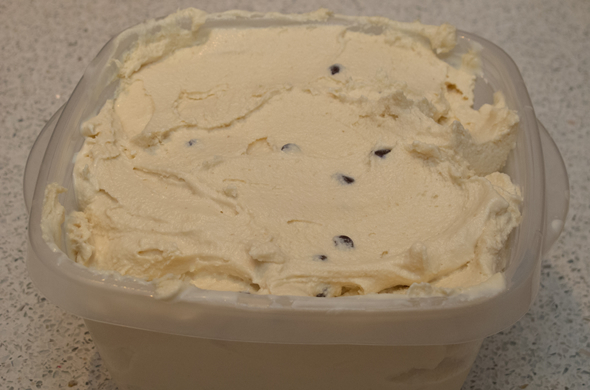 I’ve been wanting to make ice cream for awhile. I knew exactly where to go. The gals at We Are Not Martha make it all the time. A) it looks amazing. B) the extent of unique flavors is endless. I wasn’t sure how it’d go. I actually had a super frustrating experience when I attached an extra piece that wasn’t necessary for my mixer…it resulted in a crazy 20-minute detachment battle. when the bowl defrosted, I was able to slip it off. I refroze the bowl and I dropped the extra piece into my miscellaneous drawer so I can discover it later and have no idea what it goes to. The next night, when we both (the bowl & me) had calmed down, was take 2. It was easy peasy! 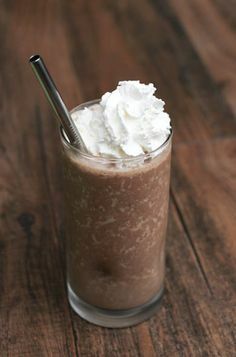 Mix in the sugar a little at a time, while continuing to whisk until it’s all blended. 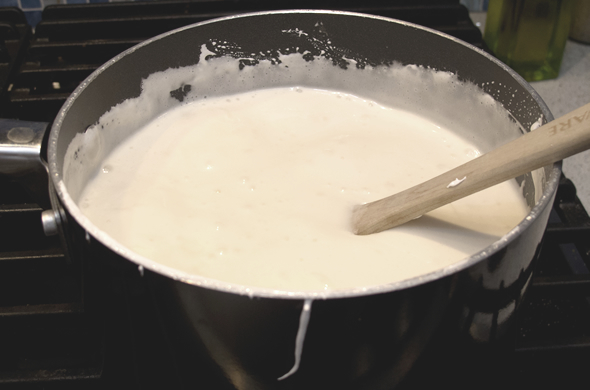 Pour the cream and the milk into the mixture and whisk until blended. 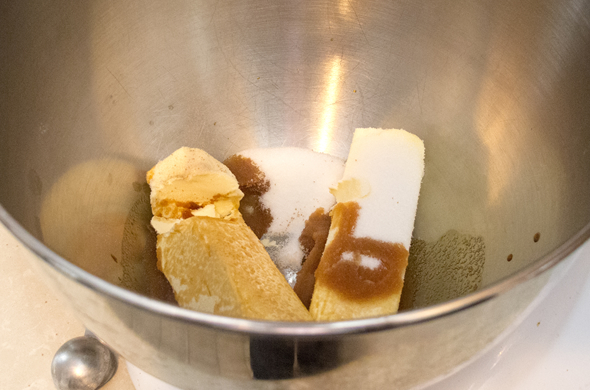 Pour one cup of the mixture into a separate bowl and whisk peanut butter into that mixture until smooth. 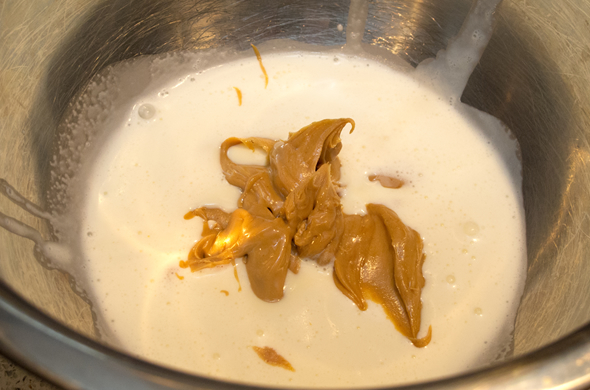 Then pour the peanut butter mixture back into the cream mixture. Whisk everything together. 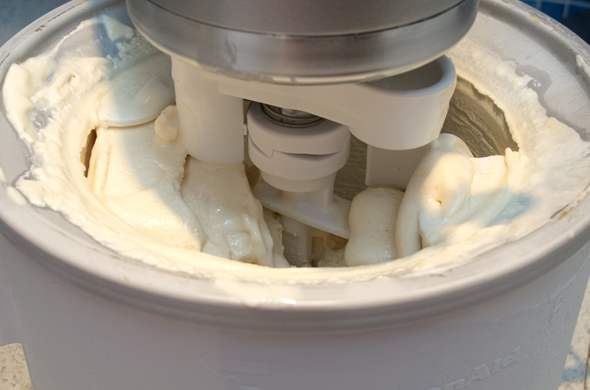 Follow the manufacturer’s instructions for your ice cream machine, but I recommend chilling cream mixture for 2-3 hours before processing. 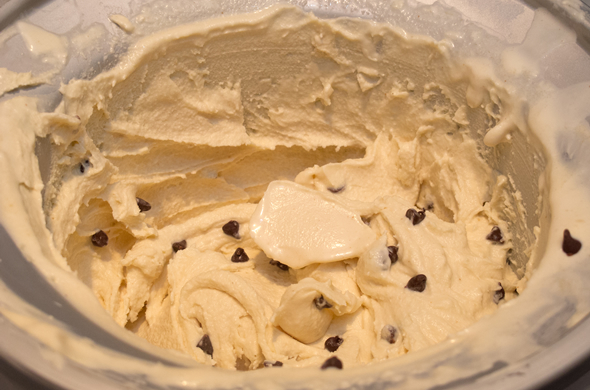 Pour into separate container and mix in chocolate chips by hand or for the last minute or two of the ice cream churning. freeze 5-6 hours, until hard. I was pretty unsure about the cream mixture (with eggs) not being cooked at all. I figured it was safe since it would be frozen, but I don’t like to mess with egg safety. I live to tell you about it. 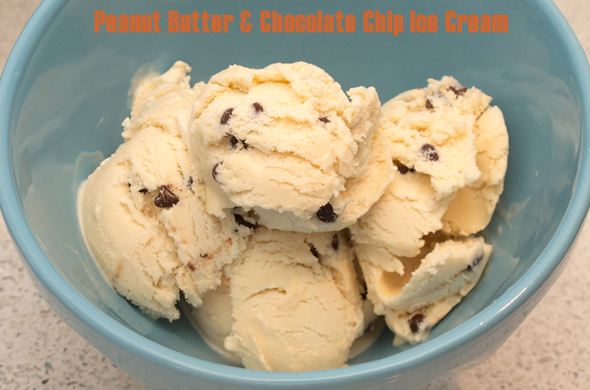 I loooved how much peanut butter flavor there was in this ice cream. And I loved that it was vanilla based. Chocolate based ice cream isn’t my favorite. I’m psyched to make other kinds. The sky is the limit! Mr. J has requested grapenut…he loves that old-man flavor. I like lots of stuff in my ice cream. Like ripples, nuts, chunks or whatever. One time way back when, on vacation with the fam in Vermont, we discovered a convenience store that sold Ben & Jerry “rejects” for a discounted price. They were labeled like “not mixed enough” or “too many chunks” as if there is such a thing! It was like a gold mine! We ate some at our rental condo in wine glasses which seemed so magically fancy when I was 6 and may have been out of rental-outfitting-necessity looking back. Nothing says “winter meal” more than soup. 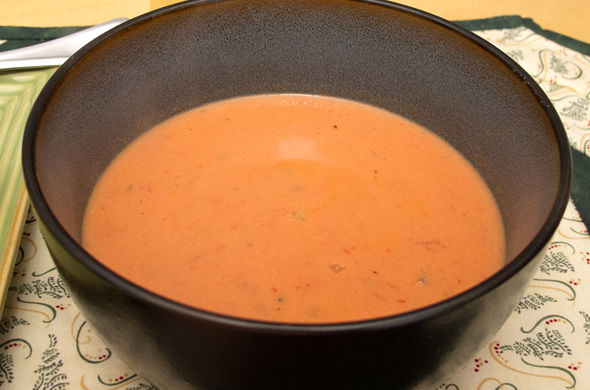 Creamy tomato soup…spiked with wine. 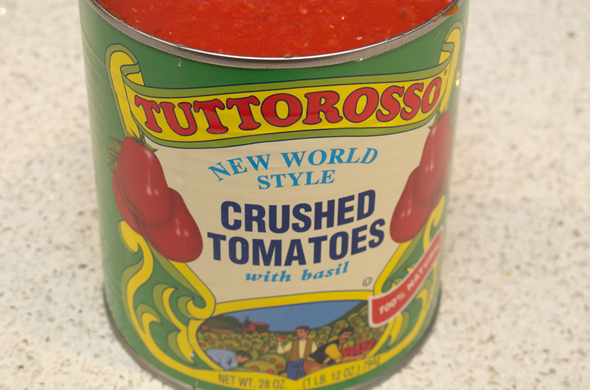 The nice folks at Tuttorosso sent me some canned tomatoes to try (and I got a beautiful new le creuset from Mr. J for Christmas) to debut so soup was in order. Don’t breeze through this thinking “didn’t she just make tomato soup?” That was different. this is different. 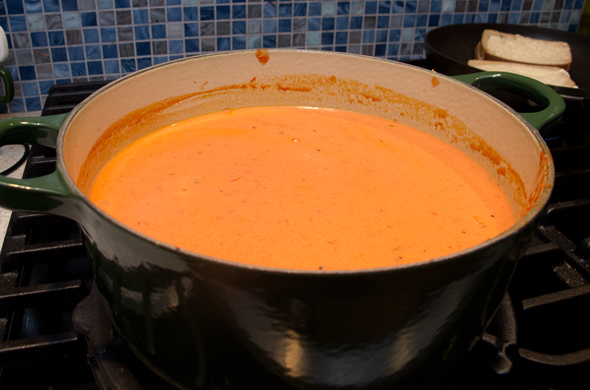 I made Ree Drummond’s Sherried Tomato Soup and loved it. It stands up to her thought that after tasting it, “solemnity and peace will be within reach”. True story. 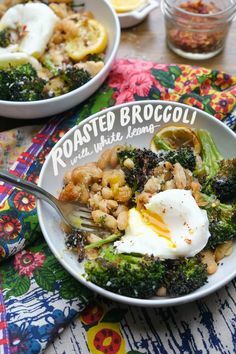 It is totally flavorful and comforting. I served it with some grilled cheeses and was thoroughly impressed. I liked how heavy-handed she is with the sherry. She’s also heavy handed with the cream making this delightful and it off-sets the sherry a bit. Heat a pot over medium heat and add onions and butter, cooking until translucent, adding garlic just for the last minute or two of cooking. 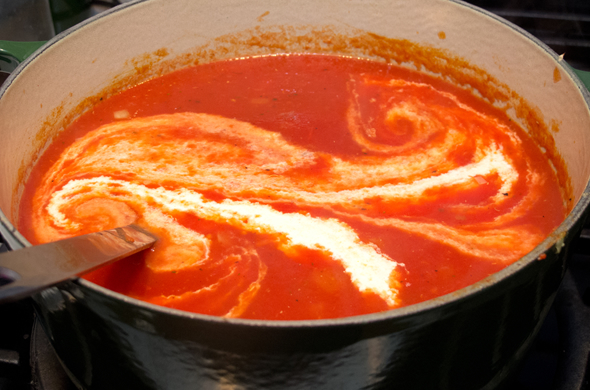 Add canned tomatoes, tomato juice, sugar, and broth cooking for 5-10 minutes to heat through and release the flavors and sugars, not boiling. While first few soup ingredients are cooking, assemble grilled cheeses or prep garlic bread. Reduce heat to medium-low, and add sherry. Now is an opportune time to start grilled cheeses or garlic bread for dipping. Cook soup for another 5 minutes. Turn heat off, and add cream & herbs. I loved the super strong tang of the sherry. Mr. J thought it was a bit too intense. You can reduce the amount or cook it a bit longer. I think soup gets a bad wrap and should be very flavorful. None of that Oliver Twist watery cabbage junk. This soup is like a warm itch-less-sweater wrapping like a hug around you. I liked this one reheated. If you’re feeling fancy, only add some of the cream to the part you’re eating right then. Reheating the soup, with the cream in it, isn’t for everyone. I like it though. A dollop of plain greek yogurt in each bowl, instead of the cream would be good. I got about 5 good-size servings out of this. Full 3 Bite Rule Disclosure: Tuttorosso sent me a set of samples of their canned tomato products to try out and taste. 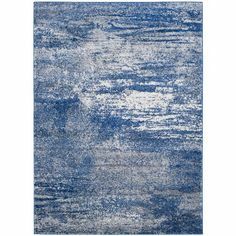 The product samples were completely complimentary but my experience, thoughts, opinions, and words are entirely my own. They are offering an apron giveaway for the first 4,000 people to “like” their page on facebook and who provide an original recipe. Also one lucky winner gets $500 to cooking.com. I gave a few edible gifts again this year for the holidays. Sometimes there’s just so much stuff. I like a few gifts in there that can be consumed, used, and then gone. I haven’t gotten crazy with my packaging but maybe I’ll have my act together enough sometime. This year I made my Dad some mocha fudge. He was telling me about some mocha fudge he had on a vacation he and my mom took so I nabbed that subtle hint and ran with it. Now let’s also set the stage: I don’t bake a lot. Making candy? Umm nope, never. My grandma used to make it and she wasn’t really a cook, so I figured if she could do it, I’d definitely give it a whirl. I followed the instructions EXACTLY. 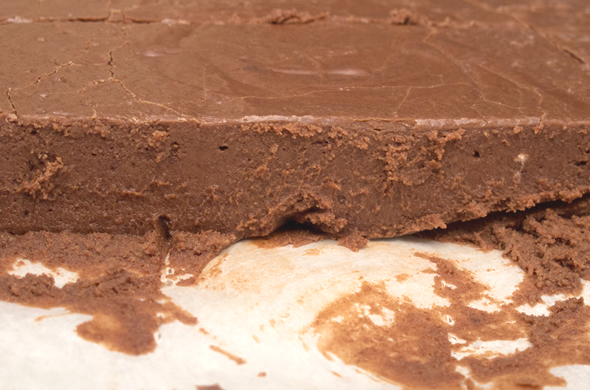 Fluff’s no-fail fudge seemed simple enough and I did it! Woohoo! Spoiler alert: success! 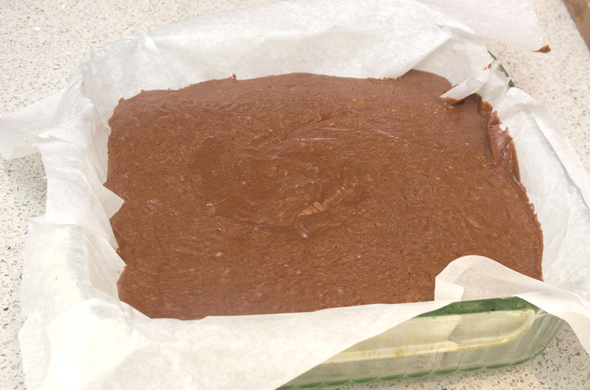 I made a half batch and it was quite a lot of fudge. Plan on giving it away. It won’t help your New Year’s resolutions one bit. I swear. I’ll stop tempting you soon. 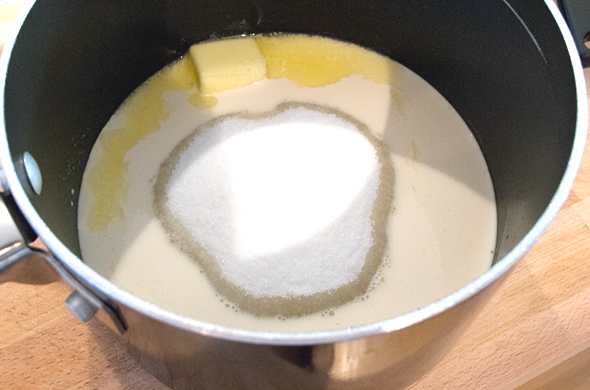 In large saucepan combine the first sugar, salt, butter/margarine, and evaporated milk. Add fluff and stir over low heat until blended. Increase heat to Medium and bring to a full-rolling boil being careful not to mistake escaping air bubbles for boiling. Boil slowly, stirring constantly for 5 minutes (use Soft-Ball test). 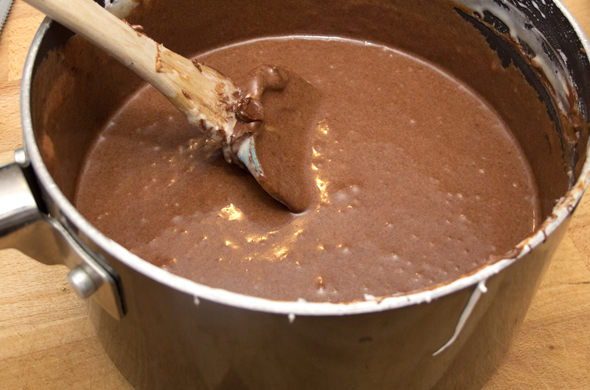 Remove from heat, stir in vanilla, chocolate pieces, and espresso until chocolate is melted. Turn into greased pan and cool. The original recipe makes 2 1/2 pounds. That is a heck of a lot for one person. I used a 9×9 pan and really liked the thickness. I can’t imagine my fudge doubled in that same size pan. The half batch is borderline-too-much-for-one-person. While it was hot, it didn’t seem very mocha flavored. I let it sit for a few hours then I thought the flavor came out big time. I gifted it in a holiday tin with wax paper. I didn’t cut it into bite sized pieces since it will get stale and hard faster. Today I have a leftovers on rehab which I like to call Tonight & Take 2. It is a great way to use something you prepped or even ate before. Using leftovers and creating them into something new is key especially since I’m cooking for 2 and love to reuse leftovers…creatively. It simplifies dinner planning and is green (environmentally speaking and money saving!). Speaking of leftovers, why were the ladies on the Bachelor so annoyed that Kacie is on, yet a gal from Bachelor Pad was no big deal? Sometimes leftovers are better the second time around! Not that I realllly want to call her leftovers, she is way more classy than the 50-shades of gray drunkard. Anywho, back to food. 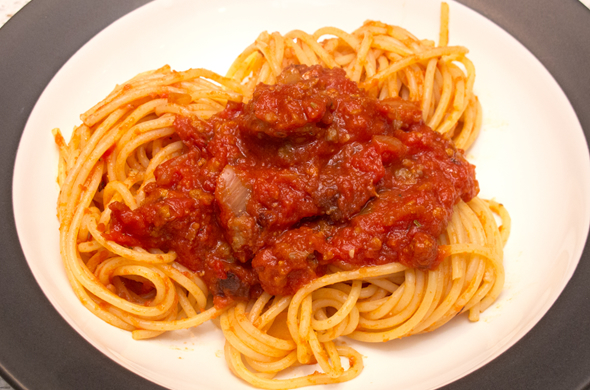 Start with bolognese sauce, or any meat sauce you like. Reheat and add a touch of cream, Parmesan, and pepperoni. Bake pizza dough in baseball/softball size blobs at 400-degrees for about 20 minutes. The interior doesn’t need to be fully cooked. 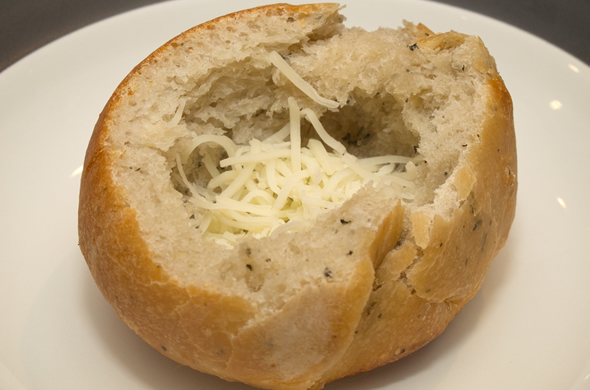 Once cooled, chop of the top, pull out the interior, and add a few tablespoons of shredded cheese. Add soup and top with another sprinkle of cheese. This was a great use of leftovers feeling completely different without pasta. 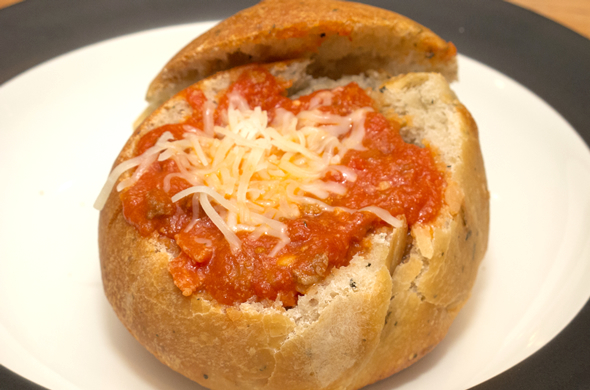 You could nix the bread bowls to eliminate a step/ingredient. I like that these guys are balanced and filling. It is flavorful and comforting without being complicated. 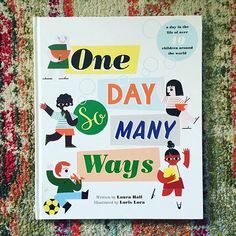 I have a surprising number of soup posts to catch you up on so hold on tight! What do you think? Thoughts about leftovers? Do you recreate them or enjoy them again and again as-is? Are you watching The Bachelor? I wanted to try out the pudding cookies that Flying on Jess Fuel made, butttt the necessary gingerbread pudding ingredient wasn’t for sale anywhere near me. The office cookie swap warranted something out of the ordinary for a holiday cookie swap. I’m not always 100% into mint so that narrows holiday cookie options. I took a personal day that would have expired by the end of the year and baked cookies at mom’s house. We made a few different kinds going and all were successful! 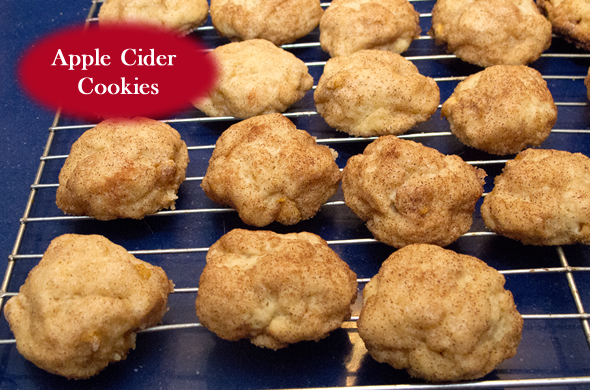 I pinned these sugar cookies made with hot apple cider mix and thought they sounded great. They seemed a bit fall-ish but I tweaked them and they were a hit for the holidays. Beat butter, sugar, cider mix, vanilla, and salt. Add flour in and mix until well combined. Mix in chips by hand. 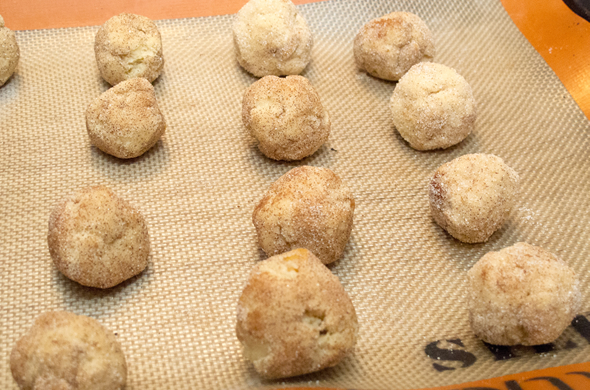 Roll cookie dough in 1 inch balls into mixed cinnamon and sugar. Bake 9 minutes and let cool on cooling racks. I loved these. I thought they were way more exciting than sugar cookies. I amped up the cider mix more than the original recipe called for and I added chips. It might be a weird ingredient to buy just for cookies, but I had some for a hot drink anyway.